An old friend from Mer Rouge, La., George Bowe, was passing through a couple of weeks ago so we decided to take a ride down to Cataloochee and see if the elk were out. We got down to the valley around 3 p.m. and before we got to the Palmer Chapel we spotted elk, grazing and generally lounging around in the fields. It was apparent that the large bulls had already dropped their massive antlers but the young bulls with spikes and small 4-point racks still had antlers. 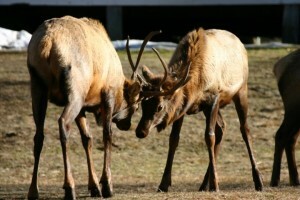 The elk were brought to the Great Smoky Mountains National Park in two groups, in early 2001. The first batch of 25 elk from Land Between the Lakes on the Tennessee-Kentucky border was released in 2001. In 2002 another 27 elk from Elk Island National Park in Alberta, Canada were released into the valley. Original reintroduction plans called for a third release but North Carolina Wildlife Resources Commission decided that was too risky (they feared chronic wasting and/or other diseases might be transferred to local deer and/or cattle populations) and the Park Service nixed the last release. Biologists in neighboring states don’t appear gripped by the same fears. Kentucky estimates its elk population at nearly 10,000 now. About 1,500 elk were released in Kentucky between 1997 and 2002. Tennessee has seen its 200 reintroduced elk (between 2000 and 2008) double in population and Virginia has plans to release hundreds of elk into the southwestern corner of the state this year. The original reintroduction in the Smokies was billed as a 5-year experimental release during which time the impacts “on” the elk and “of” the elk would be studied and a determination would be made regarding the herd’s status. Because of the inability to release more elk, the study period was extended for three years. The Park Service changed the status of the elk in Cataloochee, early in 2010, from experimental to an official reintroduction. The herd has grown to between 130 and 140 animals at this point. I was fortunate enough to get to go to Land Between the Lakes back in 2000 when the original elk were rounded up for the trip to the Park. Kim Delozier and his crew were quite professional and the capture went smoothly. However, it was apparent that these elk that lived in a 700-acre fenced-in enclosure were not the wild and wily beasts of the forests and prairies of the West, alert to every movement and/or scent that came their way; prepared to bolt for safety at a moment’s notice. And the elk George and I found the other day at Cataloochee appeared to have a healthy dose of those genes. After we passed the Palmer Chapel we saw elk again in the front yard of the old Caldwell house. We drove on down to the end of the road and upon seeing no more elk in the fields, we returned to the Caldwell house. There were a couple of elk (looked like a cow and calf) still grazing in the yard. We got out to get some photos and more elk came from behind the house. I wanted to show George the old house so we started across the footbridge figuring the elk would mosey on. Well, they moseyed – only toward us not away, so we returned to the road. Then about four young bulls came out of the woods and into the yard. A couple decided to practice their sparring moves. Next, the whole group waded into the stream for a drink. And a really curious cow and calf started towards us. We didn’t want to run afoul of any of the Park’s elk protocol, so we retreated to the truck. The cow and calf came right up and started nosing the back hatch of my white Montero. Made me wonder if the Park Service had done any supplemental feeding during the snow and nasty weather this winter from white, Park Service vehicle or if maybe unthinking visitors have actually been feeding them. Whatever the reason, it’s certainly not good to have 1,000 – pound animals that acclimated to humans – they could present a danger to unsuspecting visitors but more sadly – fed elk can be just as dead as fed bears.